5 lbs co2 tank. Keep that Keg Ready!! This is one of our best sellers. Used in many industries including off road if you can believe that. The 5 lbs co2 canister which has many prictical application such as aquariums ( freshwater and saltwater) Hydroponic plant growing, Many sports application includes the brass valve . 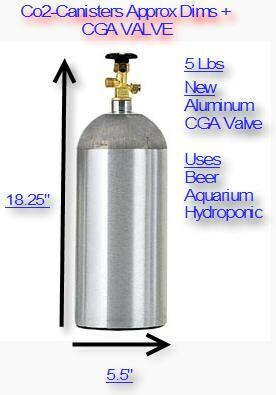 Remember with any tank you will need some type of regulator to regulate the flow of the co2 gas out 5 lb tank even though it does have an off on valve as pictured. Aluminum Cylinders are new and certified with recent date stamp for CO2 use in aquarums, beverage dispensing and painball. A CO2 valve is included with a standard fitting for easy connection to all regulators. Cylinders are shipped empty due to safety concerns.